It’s beginning to look a lot like Christmas. What better way to welcome in the holidays than with a pine-scented home, adorned with a beautiful, freshly-cut tree? Cutting down a Christmas tree is among the most nostalgic and festive holiday traditions, and Virginia is a wonderful place to do it. Round up the kids, hop in the car, and head to one of these awesome Christmas tree farms in Virginia to make sure your holiday is as magical as can be! Chilly Hollow Christmas Tree Farm in Berryville, Virginia, opens the day after Thanksgiving. Visitors can choose from Norway spruces, blue spruces, firs, scotch pines, and white pines. Stop by early to reserve the tree of your choice and pick it up later. The Evergreen Christmas Tree Farm is one of the favorite spots for Christmas tree shopping. These trees can reach up to eight feet high and include Norway spruces, white pines, and Canaan firs. Choose from over 5,000 trees. The Greenbrier Farms Nursery in Chesapeake, Virginia, starts selling Christmas trees on the Friday after Thanksgiving. Cut-your-own trees start at $95. Check the website for when Santa will be on site! The Belmont Christmas Tree Farm in Spotsylvania, Virginia, has been in the family since 1978. Their second location, in Fredericksburg, Virginia, is now open, too. Tree varieties include blue spruce, Norway spruce, white pine, and Fraser fir. Middleburg Christmas Tree Farm in Round Hill, Virginia, invites visitors to check out a Christmas tree and bring a picnic lunch while “enjoying the beautiful scenery” on-site. Take note: only cash and checks are accepted. They offer Norway spruce, Colorado blue spruce, Douglas fir, and concolor fir trees. Reed Island Farm sells thousands of premium Fraser fir Christmas trees. Since 1989, they’ve been providing the good people of Hillsville, Virginia, with trees, custom wreaths, and Santa sightings. Claybrooke Farm opens on the Friday after Thanksgiving to provide “quality service and an enjoyable holiday atmosphere” to Louisa County, Virginia, according to their website. They offer five different kinds of trees, including the Canaan fir, Nordmann fir, concolor fir, Fraser fir, and white pine. If you’re in Roanoke, Virginia, and want to choose-and-cut your own tree, then Hamill Christmas Tree Farm is the place to go. They sell white pine, scotch pine, Fraser fir, Colorado blue spruce, and Norway spruce in either choose-and-cut or pre-cut options. Stop by Hartland Farm in Markham, Virginia, for hot cups of cider and caramel apples as well as complimentary hot chocolate while you peruse their tree farm. Tree varieties include Fraser Fir, Douglas Fir, Concolor Fir, Blue Spruce, Norway Spruce, Serbian Spruce, White Pine, and Leyland Cypress. 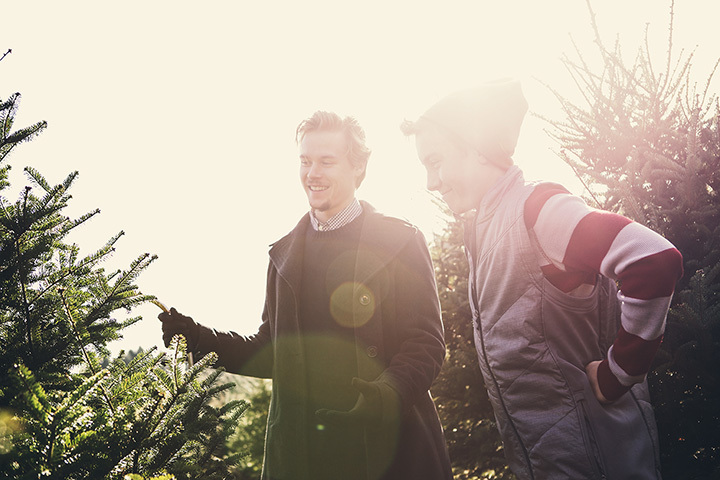 Make sure you bring a big truck to carry your tree home — the trees reach up to ten feet.